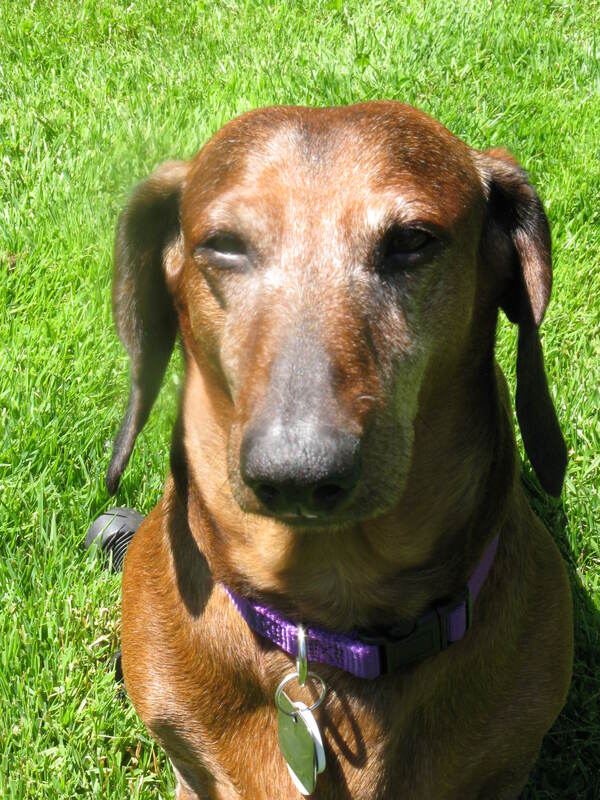 Justin, my 15-year-old dachshund, has Sundown Syndrome. It’s a form of dementia that occurs after dark. Once the sun sets, he frequently gets lost and runs into things… much like a drunk frat boy on a Friday night. Fortunately, I found an herbal remedy for him. No, it’s not marijuana, although we did try that first. Do you know how hard it is to hold a joint in tiny little paws? And the one command you can’t teach even the most obedient of dogs (which he is NOT) is “Inhale!” It doesn’t matter how many cookies you use as bribes. The concoction we’re using is called Senilife, a combination of Senile and Life. Wouldn’t you have loved to have been in that branding meeting, what with all the high levels of creativity sparking in the room? In fact, the little pill works so well I caught myself looking at the bottle the other day, wondering, “Are these just for dogs?” But then I noticed the side effects — squirrel hatred, motorcycle leg, excessive drooling… Side note, is there ever a time when drooling is not excessive? But I’m not going to take them. It’s not that I’m scared of the side effects; it’s just that I put a plan in place years ago to make sure no one would ever be able to tell when I cross the line from “normal crazy” to “she needs help crazy.” You show up at Thanksgiving dinner wearing a ski mask and an inner tube a few times when you’re still young and you set the bar pretty low. Besides, my only kids are dogs and they would never put me in a home. 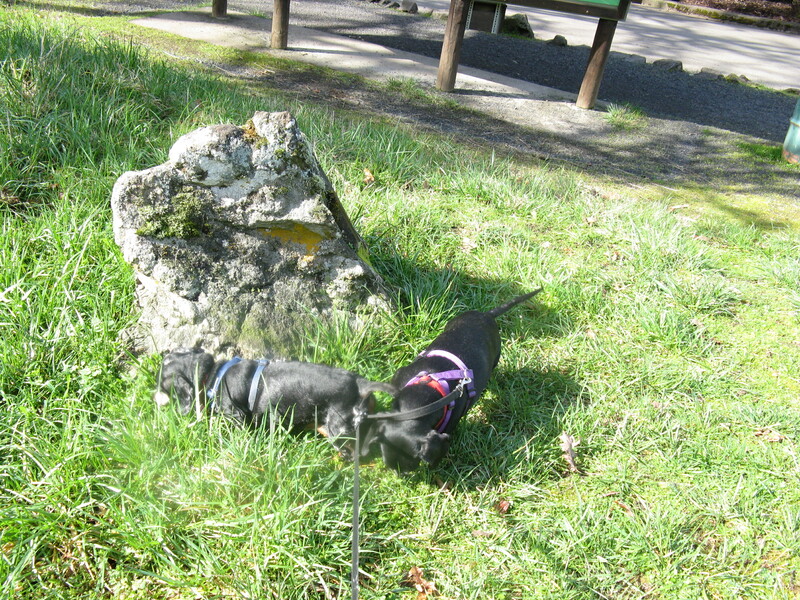 I took my three dachshunds to the park today because that big round hot thing that so infrequently appears in the Oregon sky in winter had popped out and the ground was a little less sponge-like than it had been. As we walked our 1 mile (21 in triple dog miles), I was struck by the beauty of the day — the cherry trees and forsythia are blossoming, daffodils waving their sunny heads, and people shedding their dreary hoodies and rain gear for lighter, more colorful windbreakers. Lamp post #33: Most recently visited by a Golden Retriever, Harold, who unbeknownst to his people, also has a little Cocker Spaniel in him. Harold had high end kibble for breakfast this morning, but… wait… someone snuck him a little bit of bacon. See, I told you not everyone in Eugene is a vegetarian, mom. Harold was last bathed three weeks ago but has recently been swimming with [insert giant sniff here] the fishes. Trout, to be specific. His family consists of two dads, a human sister, and three, no wait, four cats, one of which was recently “fixed.” And from the smell of things, Harold is 43″ long, has one ear that is longer than the other, and prefers to walk in the middle of the path instead of to the side. Okay, that’s all the data I can collect here; let’s move on. We live in such different worlds, canines and humans. And even though our perspectives are very different, I’m just happy to share. For the past week, I’ve been pet-sitting a terrier mix named Arrow in my home. My dogs and I have been opening our home to her twice a year for the past four years as her people travel to art shows across the country. Wiener dog: Sniff every spot in the neighborhood for 10-15 minutes to make sure nothing new has happened to that spot since the last time you sniffed it for 10-15 minutes. Then slowly move on to the next spot. Terrier: Take one quick sniff and move on. There’s nothing to see here. Wiener dog: Eat immediately after food is put within reach, sooner if at all possible. Terrier: Guard food bowl and wait for someone else to appear to want it. Growl a bit then eat as slowly as doggedly possible, all the while keeping your guard up. Wiener dog: When on a walk, be sure to always walk 6-16 feet behind your human (depending on leash length). Terrier: When on a walk, be sure to always walk 6-16 feet in front of your human. And never, ever, walk in a straight line. Serpentining burns so many more calories. Wiener dog: Spends hours arranging pillows and blankets to achieve exactly the right combination of comfort and cover in order to take a 6-hour nap. Terrier: Plop down on top of anything–sofa, chair, floor (Wiener dog says “Floor?”) and rest, making sure not to achieve too deep a sleep because someone may be nearing the spot on the floor where your food dish was until the human got tired of waiting for you to eat and put it up. Wiener dog: Play “fetch” by running after stuffed animal down the hallway a few times. Never actually retrieve said animal because how else will human get her exercise? Terrier: Play “fetch” by running up and down hallway hundreds of time whether anything is being thrown or now. Occasionally grow if anyone gets to close to your imaginary animal. Wiener dog: When temperature are below freezing, go out, do your business, and hurry back as fast as your short legs will carry you. Lie in front of heating vent for several hours to recover. Terrier: No matter the temps, go out and run across the yard yipping until human comes out in housecoat and slippers, picks you up, and brings you back inside. Run to where your food dish was and growl. I think in many ways I am more like a terrier than a wiener dog, but perhaps the reason I’ve been under dachshund management for 28 years is that I aspire for a slower paced life in which I have time to sniff what needs sniffing and get really comfortable before taking a nap.